Patterns for two aprons and a dirndl inspired skirt with shaped or straight waistband. 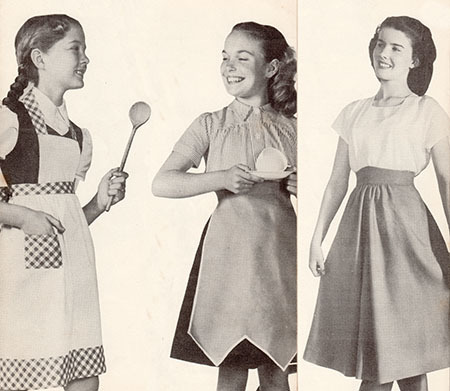 See “And Sew to Embroider” leaflet 3b for designs to embroider on these aprons and skirts. Since most of us don’t have sewing teachers in our classroom to show us the finer details of each technique, here are some modern tutorials I have found online. This video has some really great tips on thread and presser foot choice. This video uses a special skirt ruler, but you can use any ruler or tape measure. Just make sure it’s held perpendicular to the floor and not at an angle.